When We Hear the Term "Marketing,"
We Likely Think of Products, Services & Commodities. Whether you are seeking a new position, changing roles within an organization, or taking charge of your career planning, marketing yourself is the best way to seize these opportunities. Yet few of us are ready and able to talk about our talents, accomplishments, and the value we have to offer. In this engaging, timely, and informative book, acclaimed career and executive coach, trainer, and consultant Rita Balian Allen makes the case for personal branding as an essential ingredient for a successful career. IT'S TIME TO FIND OUT WHAT MAKES YOU, YOU. Complete with worksheets, checklists, and proven advice, Personal Branding and Marketing Yourself is a powerful toolkit for developing the ease, confidence, and comfort to learn about, maintain, and communicate our best professional selves. "Professional presence is a key trait for those who succeed in organizations, yet one that is very difficult to define and to mentor. In her new book, Rita Allen, with her years of excellent coaching for executives, has provided an extremely helpful resource to guide all who want to improve their stature and their ability to navigate the unspoken necessities of building a strong personal brand." "Learn the secrets to taking charge of your career! This book is full of practical tips, advice and tools for any stage of your career and provides guidance so you can get started today!" "Every page of this book is filled with tips and techniques for taking control of your career. It helps to put it all together in a way that is practical and easy to follow while keeping you engaged through real stories." "Rita has encapsulated her personal branding philosophy and many years of coaching experience into a practical hands-on framework that will help you focus on the most important elements of building your personal brand." It provides the "how to" and is a must read for all of us!" "Personal Branding and Marketing Yourself is a must read! The definition of the JOB is changing as we shift from career employment to career employability. It is no longer just what you know, but how best to tell the world what it is you know. Allen's book will take professionals in all stages of their careers through a discovery process on how best to capture and promote what is unique about oneself - keys to maximizing one's potential." "While I had been wary of applying the concept of 'branding' to my own professional life, I found Rita's approach convincing, refreshing, and applicable. Rita's '3P' process actively guides you in recognizing, defining, and articulating your authentic self. Rita's inclusion of clients' perspectives and experiences helps you see how different individuals have defined and celebrated their own personal brands." "Having known Rita for several years, I've seen her as a dedicated practitioner, colleague, consultant and friend. She has applied her years of talent management experience, knowledge and research to writing this book as an effective guide to taking charge of your career for any and all professionals. Her book captures her ability to attract the attention of sizable audiences on a variety of related topics as well as conducting one-on-one exercises with a client reflecting how desirable her expertise is regarded." "As a GenXer rising up in my career, I found Balian Allen's book to be an incredibly useful tool with practical advice on using the Three Ps Technique as a roadmap to building one's personal brand as a successful career management strategy. 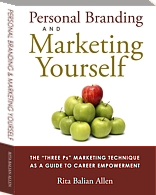 "Personal Branding and Marketing Yourself" is engaging, empowering and a terrific read for anyone looking to build their brand at any career level."